Halloween is one of my favorite holidays! I used to be damn gung ho dressing up some more. Lemme dig out some photos. …. OK I say gung ho but actually I just realized I was always very kiam with my costumes HAHAHA. 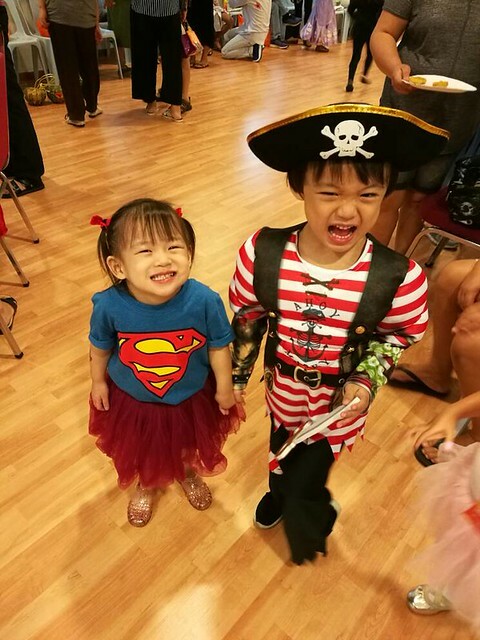 I refused to spend on expensive costumes and this was a time before DIY and Pinterest so I anyhow make do only hahahaha and my costumes were not imaginative wtf. Dressed as a bunny in Kyoto. Only because I found the ears and fluffy bobtail in Claire’s for like 200 yen wtf. Dressed as a leopard the next Halloween wtf. Also cos I found the leopard ears and tail for cheap at Claire’s. Do you see a trend wtf. This wasn’t for Halloween but it was for a Nuffnang costume party. I think the theme was animal so I went as a bumble bee. My most DIY costume cos I wrapped black ribbon around myself to make stripes, fashioned feelers out of an old headband, and used tulle to make bee wings! 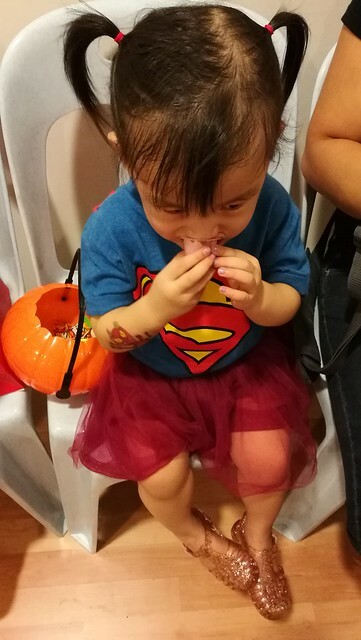 Anyway since I had babies, Halloween’s focus has always been on them. 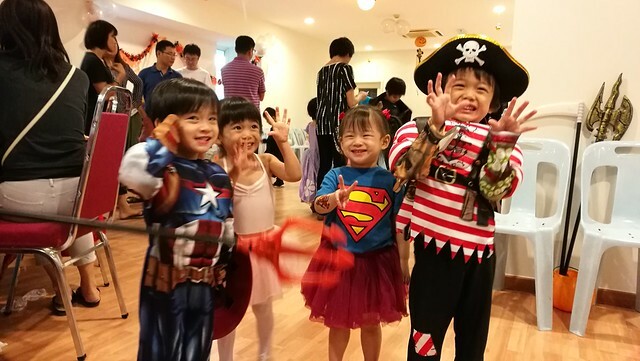 And this year we attended our first Halloween party for kids! 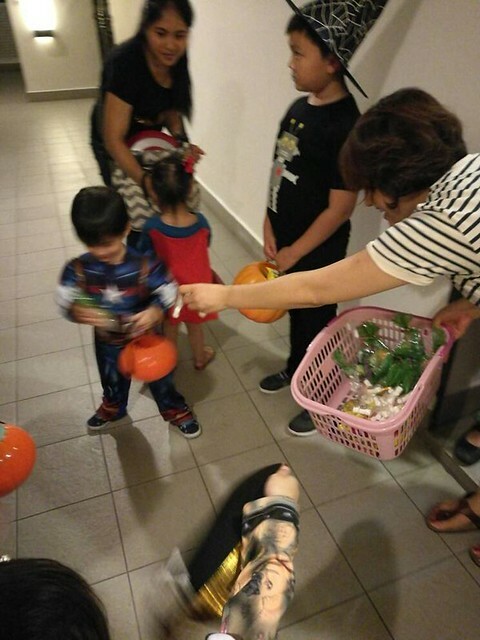 Halloween is not that mainstream here la but it’s recently been getting bigger and bigger. So yay! 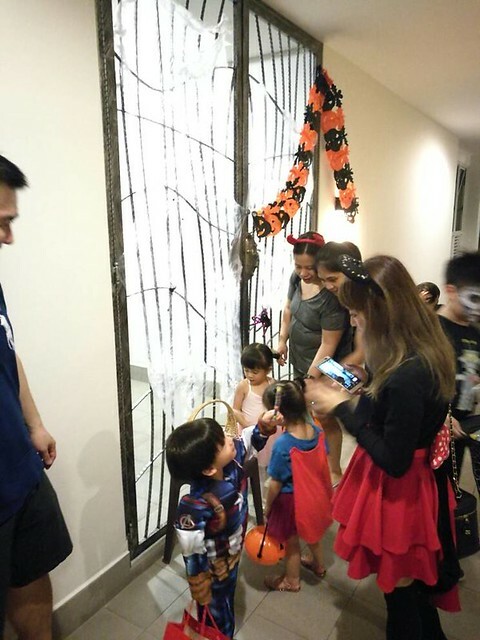 This party in particular was at a friend’s condo; the condo management damn nice organized a party and trick or treat. Whoever residents are interested can sign up and prepare treats, and the party would just head to whichever apartment. Getting ready! 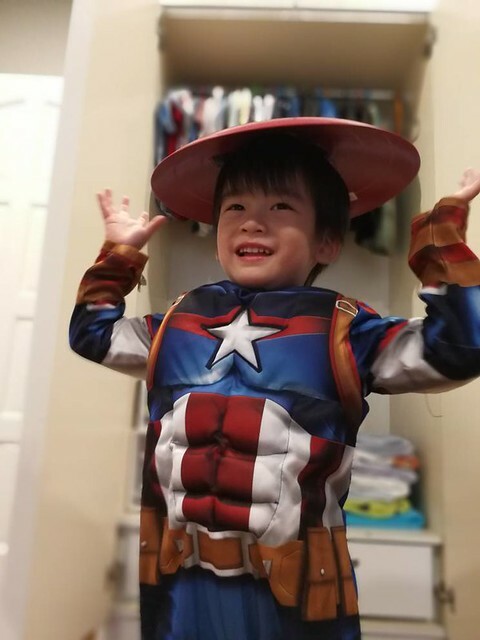 Fighter had his Captain America suit all ready and Penny has an Anna from Frozen dress AND a Belle dress from Beauty and the Beast but what does she want to go as for Halloween? I gotta give it to her for choosing strength over beauty lolol. 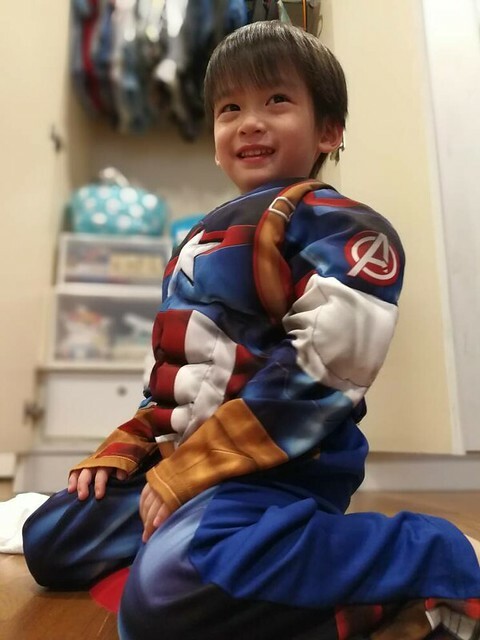 Koko on the other hand was super proud to wear his Captain America suit! Suet got it from the UK and it comes with a mask and a shield! He refused to put on the mask though wtf. Suit comes with built in abs HAHAAHHAHA. Supergirl and Captain Chase wtf. Fighter is mildly interested in superheroes but Chase is obsessed with pirates and the ocean. These four as usual hahaha. 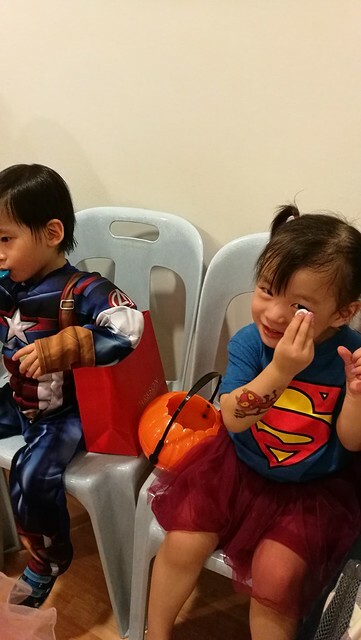 Lollipop is a ballerina and looks super pretty next to my Supergirl hahahaha. 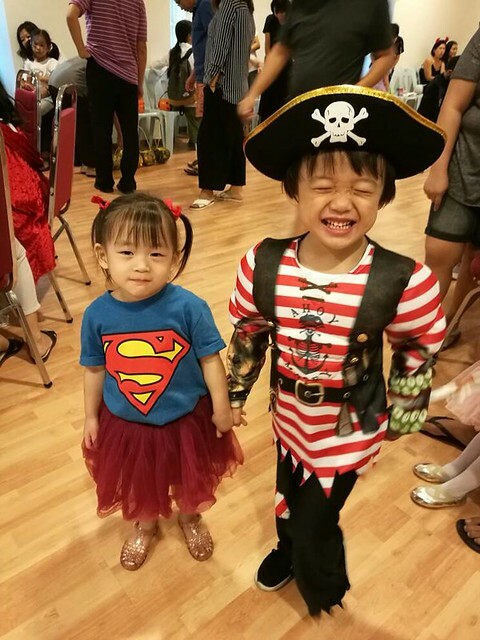 OMG Supergirl’s smile beh tahan. And got double chin suddenly hahahahaha. These two suddenly damn lovey dovey kept holding hands hahaha. Trick or treat! Our first time doing this ever and I really had a lot of fun, don’t say the kids hahaha. Like there was this warm sense of community even though it isn’t even our condo lolol. This guy went all out I think he should win best dressed WTF. 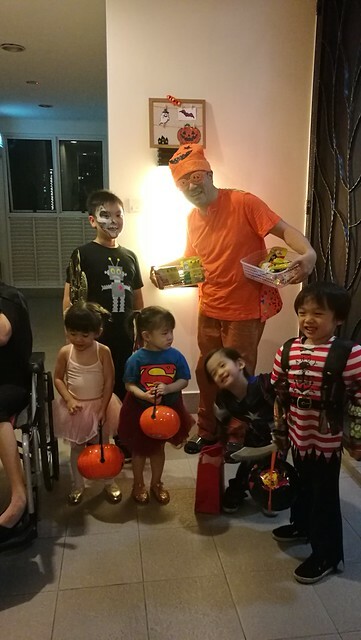 Fighter started calling him Pumpkin Uncle and I think the uncle was a bit amazed cos that wasn’t the look he was going for apparently hahahaha. Trick or treating over, time to indulge wtf. Penny is holding up a chocolate eyeball hahahaha. These gluttons cannot wait lol. Unrelated photo cos we were so surprised we didn’t snap any. But they had a Best Dressed contest at the end of it and Fighter was one of the best dressed winners hahahaha. Captain America woohoo wtf. He won…. a bar of chocolate wtf. And that was our Halloween! The kids loved the whole process and the candy of course. And it’s rekindled my love for costumes hahahaha. 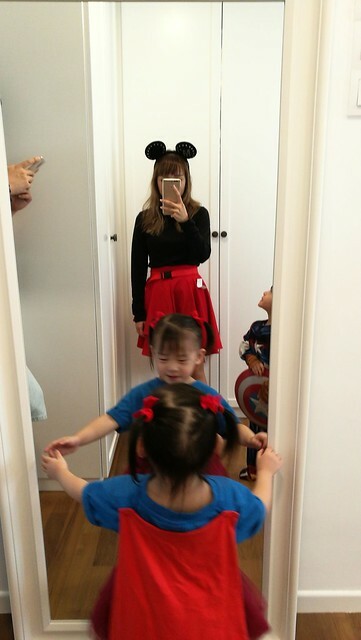 Next year Imma start work on their costumes after CNY WTF Fatty included. Hi Audrey! 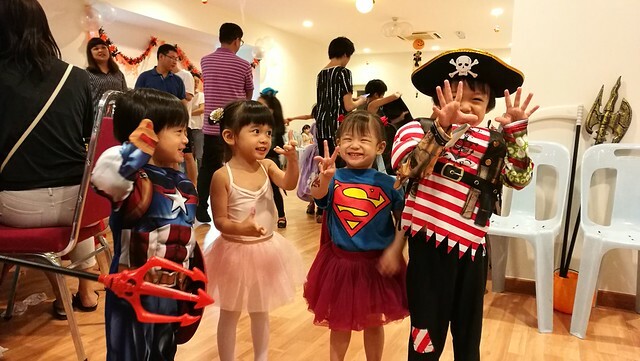 Halloween is so much fun especially when you have little ones and you can not only dress them but do an entire family theme for costumes! 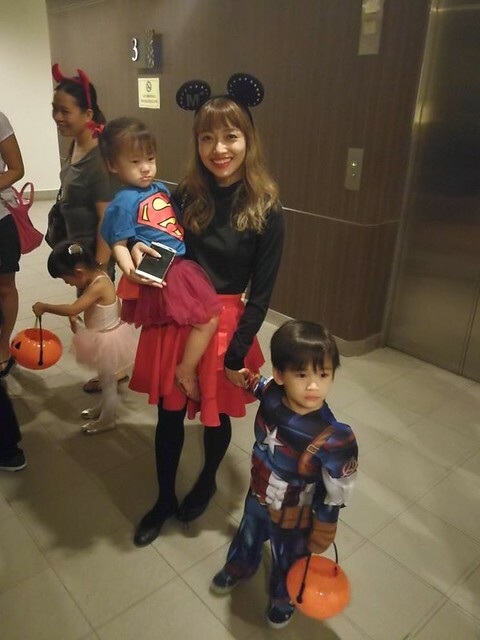 The kids looks adorable!